BMPs are control measures taken to address changes to the quantity and quality of urban water runoff that result from land use changes. Increased hard cover (e.g. parking lots, rooftops, roads) causes stormwater runoff to increase and allows stormwater to carry more pollutants to our lakes and rivers. BMPs, such as stormwater ponds, raingardens, and green roofs, reduce the risk of flooding by reducing the rate at which stormwater enters our storm sewer system and surface waters. BMPs also reduce pollutant levels in our water bodies by allowing pollutant-carrying sediments to settle out of the water and by removing excess nutrients through biological processes. 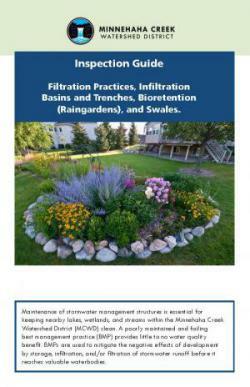 The Minnehaha Creek Watershed District regulates stormwater management for redevelopment and new development projects through the MCWD Stormwater Managment Rule. For many projects, permanent BMP's are required to be installed and maintained. All BMPs require regular maintenance to function properly. To ensure inspections and maintenance are performed, a Declaration and Maintenance Agreement (Word) is recorded with the county and tied to the property on which the BMP is located. One of the requirements for nearly all BMPs within the MCWD is a yearly inspection. View instructions for filling out a Declaration and Maintenance Agreement (Word). Different BMP's require varying levels of inspection expertise. Depending of the type of BMP located on your property, a professional company may be required to perform inspections and maintenance. 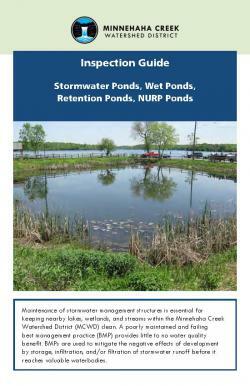 To perform your own inspection, download and fill out your BMP Inspection Report, take pictures of the BMP, and e-mail to the MCWD Permitting Staff or mail to MCWD Permitting Department, 15320 Minnetonka Boulevard, Minnetonka, MN 55345.